In the summer of 1957, Mario Bruschi and his mother Adele, traveled from their home in New York City to the town of Ponte Strambo, in northern Italy, to visit relatives. Mario’s mother had just read a biography of Padre Pio which she had enjoyed immensely. She shared some of the details of Padre Pio’s life with Mario. She decided that she wanted to travel to San Giovanni Rotondo to attend Padre Pio’s Mass and she asked Mario to accompany her. But to twenty-three year old Mario, the prospect did not sound very interesting. He was having a great time in Ponte Strambo, meeting new friends and going dancing at the local night clubs in the area. At that time in his life, his Catholic faith meant very little to him. To his mind, he had a lot more interesting things to do rather than to go to a monastery to see an elderly friar. He declined his mother’s invitation. However, Mario’s aunt Rina spoke to him about Adele’s plan and convinced him otherwise. “Your mother should not make the trip alone,” his aunt said. “It will be much safer if you go with her.” Mario realized the truth of his aunt’s words and decided to accompany his mother. He thought that they would probably spend one day at Padre Pio’s monastery and then be on their way home. He wanted to spend as much of the summer as he could with his new found friends in Ponte Strambo. Mario was irritated with his mother for not telling him until after they boarded the train that it would be at least a twelve-hour trip to get to San Giovanni Rotondo. 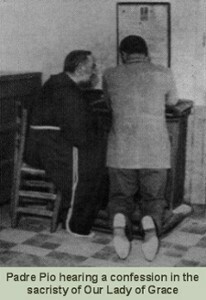 When they finally arrived at the monastery of Our Lady of Grace, the first order of business was to get a ticket for Padre Pio’s confessional. Adele was informed that she would have to wait ten days for her number to be called. The thought of being stuck in San Giovanni Rotondo for ten long days was hard for Mario to accept. There was the monastery and the church and practically nothing else in the area. Adele encouraged Mario to get a ticket for the confessional and told him that she was sure he would not regret it. It would be a wonderful opportunity. Reluctantly, he asked for a ticket from the Capuchin in the booking office. As the days passed, Mario and Adele became accustomed to the daily routine at Padre Pio’s monastery. Everything revolved around the small 16th century church of Our Lady of Grace. Almost all of the visitors to San Giovanni Rotondo spent their days in the church because that was where they could find Padre Pio. Mario and his mother were surprised to find that the people in the church were often noisy and rude. The Capuchins would frequently stand at the front of the church and order everyone to stop talking. “Silencio!” they would repeat, but no one paid any attention to them. However, when Padre Pio called for order in the church, everyone stopped talking at once. Mario and his mother attended Padre Pio’s early morning Mass which began at 5:00 a.m. For the pilgrims, it was the highlight of the entire day. For Mario, it was a test of patience. It was the longest weekday Mass that Mario had ever attended in his life. Padre Pio became deeply absorbed in prayer during the Holy Sacrifice, hence the long and extended periods of silence. Mario found himself becoming annoyed with the time it took for Padre Pio to say the Mass. To him, it seemed excessive. Because the little church was too small to accommodate the crowds and because of the summer heat, the Mass was held in an outdoor arcade. Mario attended the Mass each morning with his mother. He made sure to avoid making eye contact with Padre Pio during the Mass. Having heard that Padre Pio had the gift of reading hearts, the thought of direct eye contact with him made Mario feel uncomfortable. It was the custom for the Capuchins to invite the pilgrims who had traveled from a distance to serve at Padre Pio’s Mass. Mario was asked if he would like to be the altar server but he declined the invitation. Kneeling on the hard stone by the altar for such an extended period of time was not something that he wanted to attempt. However, as the days passed, the annoyance that Mario had initially felt during the Mass vanished and instead, he began to feel greatly uplifted. The Mass was still long but for some reason, the time seemed to pass quickly. Mario watched Padre Pio’s movements closely. Sometimes Padre Pio’s eyes would twitch. At times, he would stare upwards in a fixed spot and remain completely motionless. Tears would fall freely from his eyes. He seemed to be seeing something that no one else present could see. His deep communion with God was so apparent. Every day was just like the previous one for Padre Pio. His world revolved around the altar, the confessional, the choir loft, the monastery garden, and his solitary cell. Once in a while there was a special ceremony in the church, a baptism, a wedding or an anniversary celebration. One afternoon, Mario walked into the monastery church of Our Lady of Grace while a wedding was in progress. Padre Pio happened to be the celebrant that day. Mario had his camera with him at the time and was happy for the opportunity to take some photos. Padre Pio noticed that Mario was taking pictures and motioned for one of the Capuchins to speak to him. He was informed that he was not allowed to take photographs inside the church, so he quickly put his camera away. He was happy that he had been able to take about seven pictures before he was advised to stop. When he went to get the film developed, all of the pictures came out blank. He asked the film developer for an explanation since he had used brand-new film. He told Mario that he could find no reason for the malfunction. Later, Mario learned that it was not unusual for photos to come out blank on the occasions when Padre Pio did not want to be photographed. Another time, Mario happened to be in the sacristy of the church as Padre Pio was putting on the special vestments in preparation for Benediction. Padre Pio first wrapped a short, white linen cloth called an amice, around his neck and shoulders. Next came the white robe called an alb, then the rope around his waist called a cincture, and finally the stole which he placed around his shoulders, over the alb. The moment that Padre Pio put on the amice, Mario perceived the beautiful fragrance of roses filling the sacristy. The day for Mario to make his confession to Padre Pio finally arrived. He grew increasingly nervous as the time approached. 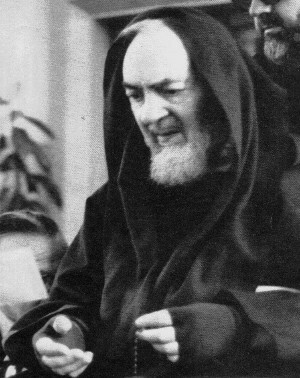 He had heard about Padre Pio’s gifts of discernment and dreaded the thought that Padre Pio might be able to read his soul. Mario was afraid that Padre Pio might see and reveal to him, the sins in his life of which he was ashamed. He was standing near the front of the confessional line when he saw an incident that filled his heart with trepidation. Padre Pio, in a voice full of authority, reprimanded a man and ordered him out of the confessional. Deeply embarrassed, and with his cheeks flushed red, the man had no other recourse but to walk past all the men who were waiting in the confessional line. Everyone saw what had happened. Mario told the man who was standing behind him in line that he could go in front of him. “But Padre Pio is pointing at you. He wants to see you,” the man replied. Mario looked in Padre Pio’s direction and found that it was indeed true. Padre Pio was looking directly at Mario and beckoning him to come into the confessional. The man standing behind Mario in line gave him a shove forward. At that time, the men’s confessions were heard in an open confessional in the sacristy of the old church. Padre Pio sat on a chair and a wooden kneeler was placed in front of him. A curtain was provided for privacy. Very slowly, Mario walked toward the confessional. Slowly, he reached for the curtain and pulled it closed. He was hoping that by his slow and deliberate movements, he would have at least a few minutes to buy some time to collect himself and to regain his composure. After Mario closed the curtain and knelt down, Padre Pio patted his hand lovingly and said to him gently, “Be tranquil, my son. Calm yourself.” The words seemed to be charged with power for at once Mario felt a great tranquility, a wonderful peace take possession of his soul. The trembling in his body stopped altogether. Padre Pio then asked Mario a number of questions. “Do you say your morning prayers?” Padre Pio asked. “No, I do not,” Mario replied. “Do you say your night prayers?” Padre Pio asked. Once again Mario had to say no. “Do you tell lies?” “Yes, I have told lies,” Mario replied. It went on like that with more questions, more admissions. Padre Pio seemed to know exactly the right questions to ask. They were all related to Mario’s areas of weakness. Mario had the feeling that Padre Pio knew the answers to the questions, even before he asked them. Mario had no need to tell his sins; Padre Pio was naming them for him. “I do not know what to do with my life,” Mario said. “I don’t know what field of study or career to pursue. Could you give me some advice?” “Preghiamo, figiu mi,” (Pray, my son) Padre Pio answered. Padre Pio’s voice was so sweet, so tender. He spoke Italian in the Pugliese / Neopolitan dialect. Mario felt fortunate that he could understand the dialect. Mario then asked Padre Pio about a matter concerning one of his brothers. Padre Pio’s response was, “Preghiamo, figiu mi,” Lastly, Mario spoke to Padre Pio about his mother, Adele. Once again, Padre Pio advised him, “Preghiamo, figiu mi.” Padre Pio was so kind, so gentle. “Go in peace, my son,” Padre Pio said as Mario kissed his hand. He gave Mario a blessing. The confession was over but Mario did not want to leave the confessional. He wanted to stay with Padre Pio forever. The thought came to Mario that if Padre Pio had asked him to stay on in San Giovanni Rotondo, he would have agreed to it in an instant. He would gladly be willing to do any work, no matter how small or menial, just to be able to be near Padre Pio. But Mario knew that was just wishful thinking. He and his mother would soon be going back to the northern part of Italy and later they would return to their home in New York City. Mario thought about the long line of men just a few feet away, waiting patiently for the same opportunity, the same blessing that he had just received. He forced himself to get up and walk out of the confessional. But Mario was disappointed, deeply disappointed. He had the highest esteem for Father Giovanni Battista but he had wanted to receive absolution from Padre Pio. Although Father Giovanni Battista tried to assure him that everything was all right, in his heart, Mario wondered what had gone wrong. There were usually three reasons why Padre Pio would withhold absolution. Those who were insincere, or those who came to see Padre Pio simply out of curiosity, were usually turned away. He would frequently withhold absolution from those who were not properly disposed and had not made a good preparation to receive the sacrament. He would also withhold absolution from those who were not sorry for their sins and had no desire to change. Many people made their confession to Padre Pio but had no real desire to amend their life. They knew that they would continue to commit the same sins; they were not ready to give them up. It became easy for them to go from sinful acts to confession and right back to the sinful acts. Their souls were in grave danger but they remained completely indifferent to their situation. Padre Pio knew that they had to be shaken out of their spiritual lethargy. Something had to grab their attention. On occasion, he withdrew absolution. Being denied absolution was a definite “attention-grabber.” In this way, Padre Pio let the penitents know that by their own decision, they had forfeited the grace of God. The shock of not receiving absolution often woke them up and brought about the spiritual change that was needed. Mario followed Father Giovanni Battista into the private quarters of the monastery. Once again, he made his confession. He received absolution and was assured that he was in a state of grace. As Mario and Father Giovanni Battista left the small chapel and walked down the corridor, they passed by Padre Pio’s cell and noticed that the door was open. A young altar boy was assisting Padre Pio and helping him put his sandals on. Mario was startled to see that Padre Pio’s bed was completely covered with letters. The amount of letters was so great that not even the blankets on his bed could be seen. “Mario, this is your chance,” Father Giovanni Battista said. “Padre Pio is in his cell. Stand right by his door and wait for him. You can ask him for the absolution that he did not give you.” But Mario knew that he did not have the courage to ask Padre Pio for absolution. Just the thought of it was frightening to him. Padre Pio walked out of his cell and saw Mario standing in the hall. For some reason, Father Giovanni Battista was no place to be seen. As Padre Pio drew closer, Mario knelt down. “What is it you want?” Padre Pio asked. “I think that you forgot to give me absolution when I made my confession to you,” Mario replied. “If it is possible, I would like to receive it at this time.” Padre Pio placed his hands on Mario’s head in a blessing, just as he had done before. Mario once again kissed his hand and waited, but the words, “Ego, te absolvo,” were not spoken. Padre Pio then started to walk down the corridor but before he had gone even ten steps, he stopped and looked back at Mario. With deep concentration, he stared at him in silence. Then he raised his eyes heavenward and remained motionless for some moments. He then turned and continued to walk down the corridor until he disappeared from view. The next day, Mario and his mother would be leaving San Giovanni Rotondo to take the train back to Ponte Strambo. Father Giovanni Battista knew that Mario wanted to say goodbye to Padre Pio. He told Mario that Padre Pio would be at the monastery stairway at 11:00 a.m. the next morning. If Mario could be there at the same time, he could receive a final blessing from him. As Padre Pio started to walk down the stairs, Mario took hold of his arm to assist him. One of the Capuchins held his other arm for support. As they descended the stairs, Mario could tell that Padre Pio was suffering greatly. He had to walk slowly for it was very painful for him to walk on his stigmatized feet. Mario knew what a privilege it was to be able to help Padre Pio down the stairs. As they made their way toward the landing, many people were reaching out their hands, trying to touch Padre Pio and speak to him. Before they left San Giovanni Rotondo to return to Ponte Strambo, Mario’s mother, Adele, obtained another ticket for Padre Pio’s confessional. She explained to Mario that they were going to have to return to the monastery in just a matter of days. She had been so excited about being able to make her confession to Padre Pio that she forgot to kiss his hand, and she had a great desire to do so. When getting her new ticket, she tried to estimate how many days the wait would be before her number was called. She estimated correctly, for she and Mario returned to the monastery on the very day that her name and number were called. She had a chance to see Padre Pio once again and to kiss his hand. To Adele, it was well worth the twelve-hour train trip. Mario reflected many times on every detail of his trip to San Giovanni Rotondo. It had been a painful experience for him to realize that Padre Pio had not given him absolution. It caused him to do some very deep soul-searching. Mario knew that he had been negligent in the practice of his Catholic faith for a long time. Before visiting Padre Pio, Mario had been fully engrossed in worldly pursuits. He was completely indifferent to the state of his soul. The only reason he went to Mass on Sundays was because his mother expected it of him. Other than that, it meant nothing to him. Although he went to confession on occasion, he knew he would go right back to committing the same sins that he had previously confessed. He was attached to his sins; he did not want to give them up. In San Giovanni Rotondo, while waiting to go to confession to Padre Pio, Mario had not really made a good preparation. He had not made a serious examination of conscience before receiving the sacrament. Visiting Padre Pio had made Mario aware of the great spiritual distance which separated him from God. He came to realize that he had been offending God by his lifestyle. If Padre Pio had not denied him absolution, he probably would never have realized that his soul was in grave danger. The times that he had made his confession in the past had brought no real change for him. But making his confession to Padre Pio marked a turning point in his life. He would never be indifferent to spiritual matters again. Mario returned to his home in New York City, but it was not to business as usual. In order to learn more about Padre Pio, he bought a biography of his life and read it with great interest. He prayed for Padre Pio’s guidance and intercession. He began to attend daily Mass. He had the desire to spend time in church in front of the Blessed Sacrament and he asked his pastor if it would be possible to have an all night prayer vigil at the parish. The pastor thought it was a good idea. Mario organized the prayer vigil which began at 9:00 p.m. and continued until 6:00 a.m. the next morning. It was held on the first Friday of the month and was always well-attended. Continuing his education, Mario graduated from St. John’s University in Queens, New York and went on to get his Master’s Degree from John Jay College of Criminal Justice in New York City, New York. He felt very fortunate to find a very good job with the state of New York in the field of social service. It was in the beautiful church of Our Lady of Peace in New York City that Mario met his future wife, Sarojini Kannangara, a native of Sri Lanka. They married in 1972. Their first child, Pia Angeli, was a true blessing from God. In 1973, the Bruschis’ traveled to Sri Lanka to visit family members. While in Sri Lanka, a country that is only 7 percent Catholic, Mario gave a talk on Padre Pio and showed a documentary film of his life. The presentation was very well received by both Catholics and non-Catholics alike. Mario had only planned on showing the film once while on his vacation in Sri Lanka. He was surprised to receive many requests for additional showings of the film in other parts of the country. He was very happy to answer the requests. The response to the documentary was so enthusiastic that double showings had to be given on many days. Mario spent almost the entire three weeks of his vacation traveling from one end of Sri Lanka to the other, showing the film. Quite unexpectedly, his first trip to his wife’s homeland, turned out to be a “working” vacation. He hardly had time to relax, but sharing the message of Padre Pio proved to be very rewarding. Mario also received many inquiries regarding the Padre Pio prayer groups. Through his assistance, many Padre Pio prayer groups were established in Sri Lanka for the first time. When his three-week vacation was over, Mario knew that his work on the beautiful tropical island of Sri Lanka was not. He returned to Sri Lanka nine more times, sharing the story of Padre Pio from town to town and village to village. Most Reverend Dominic Athaide, the archbishop of Agra, India invited Mario to show the documentary film of Padre Pio to the people of India. The archbishop had a great devotion to Padre Pio. He had previously visited San Giovanni Rotondo and had met Padre Pio. Mario accepted the archbishop’s invitation and traveled to India three times, showing the film of Padre Pio in the cities of Madras, Bombay, Agra, Delhi and many others. Although India is less than 2 percent Catholic, Mario noticed the same interest and receptivity as he found in Sri Lanka. In India, he spoke in schools, seminaries, parishes, private homes, hospitals and cloistered convents. During his travels, Mario made his lodging in the Capuchin monasteries of southern India. He came to have great admiration for the Capuchin priests and brothers who lived in India. Their lifestyle was simple and austere, true to the spiritual ideals of St. Francis of Assisi. In accord with the monastic custom, Mario slept each night on a straw bed with a hard pillow. He traveled to each new destination, not in an automobile, but in a simple rickshaw. He was able to adapt to the culture of India in all ways, except one. The traditional food, namely the very hot and spicy curry dishes, proved to be more than Mario could handle. He finally settled for boiled vegetables only, with no spices. While in India, Mario showed the film of Padre Pio’s life to the members of a leper colony in the city of Agra. The lepers were very inspired by the presentation. They told Mario that the film on Padre Pio gave them a great sense of hope. Mario was very impressed with Archbishop Athaide’s important work at the leper colony in Agra. In an effort to provide assistance, the archbishop asked the lepers to list their fifteen most immediate needs. After reviewing their comments, the archbishop finally asked the lepers, “What is your greatest need?” Their answer was, “spiritual consolation.” It was the same great need that Mario saw in all of his travels. Everywhere, people were hungry for spirituality, the consolation of a deep prayer life, the need for God. Through his public lectures as well as the showing of the documentary film, Mario was able to introduce thousands of people in the Far East to Padre Pio. But Mario thought of a way to reach even more. He contacted one of the executives in charge of television programming in Sri Lanka and asked if it would be possible to have the film of Padre Pio shown on Ceylon television, which broadcasts not only to Sri Lanka but also to southern India. The executive viewed the film and approved it. When the program was aired, it is estimated that between 17-20 million viewers watched the program and were introduced to Padre Pio in that way. 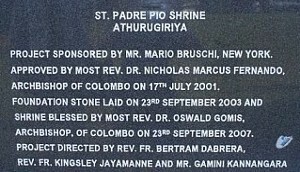 It was Mario’s dream that one day the country of Sri Lanka would have a church named in honor of Padre Pio. He spoke about it to Most Reverend Marcus Fernando, the archbishop of the diocese of Colombo, Sri Lanka. The archbishop was very supportive of the idea. The following year, Mario returned to Sri Lanka. He and his brother-in-law, Gamin Kannangara began making plans for the new church. With the help and guidance of Father Bertram Dabrera and Father Kingsley Jayamanne, the dream began to materialize. Mario went back to the United States and raised most of the funds for the project. 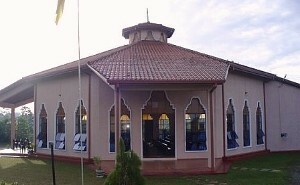 On September 23, 2007, Most Reverend Oswald Gomis consecrated the beautiful and stately St. Padre Pio Shrine Church in Athurugiriya, Sri Lanka. It is the first church in Asia to be dedicated to Padre Pio. Several first class relics of St. Pio have been enshrined there for public veneration. A Padre Pio prayer group has also been established there. 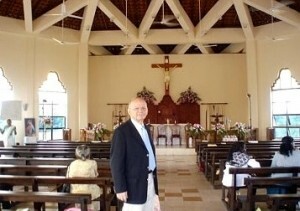 People now travel from all parts of Sri Lanka to visit and pray at the St. Padre Pio Shrine Church in Athurugiriya. Back home in New York City, where Mario and his family make their home, Mario has shown the documentary film on Padre Pio’s life in more parishes than he can count. A number of people have told Mario through the years that seeing the film on Padre Pio changed their life. It was the wake-up call that brought about their return to the Church and to the Sacraments. For more than twenty years, Mario has organized the annual Padre Pio Mass and celebration that takes place every August at the shrine of Our Lady of Fatima in Washington, New Jersey. Three thousand people attend the full day of prayer, adoration, holy hour, Mass and procession. In New York City, Mario is the organizer for the annual Mass for St. Pio at St. Patrick’s Cathedral. Mario has personally started twenty-five Padre Pio prayer groups. One of the most rewarding of the Padre Pio prayer groups that he has organized and that he leads each Thursday afternoon, is held at the Metropolitan Correctional Facility, a branch of the federal prison in New York City. The format for the prayer group includes the recitation of the Rosary, the Divine Mercy chaplet, prayer for the intercession of St. Pio, and a talk on the life and spirituality of St. Pio. One of the inmates who attended the Thursday afternoon Padre Pio prayer group felt the beneficial spiritual effects, and wanted to share what she had received with others. When she was released from the Correctional Facility, she returned to her home in Columbia, South America and started a Padre Pio prayer group there. Mario has also given Padre Pio presentations at the federal prison in Otisville, New York, showing the documentary film on Padre Pio in both English and Spanish. He regularly visits Catholic schools, sharing the story of Padre Pio with children in elementary school and junior high school. Mario attributes the conversion of his late brother, Dr. Walter Bruschi, to the intercession of Padre Pio. Walter worked as the Chief of Psychiatry at the Menninger Foundation in Topeka, Kansas. Mario frequently had discussions with his brother about Padre Pio. Walter had a brilliant mind and could hold his own in any conversation. However, whenever Mario talked to Walter about Padre Pio, he felt that his words were falling on deaf ears. Walter had been away from his Catholic faith for most of his adult life. He doubted every word that Mario said about Padre Pio. “It is science that I believe in, not religion,” he would say to Mario. But a turning point in Walter’s life came when tragedy struck the family. His twenty-three year-old son died suddenly, leaving the entire family devastated. Walter visited Mario in New York shortly after his son’s death. He told Mario that he wanted to find a spiritual director and asked him if he could recommend a good priest to him. Mario gave him the name of an excellent priest who was gifted in the field of spiritual direction. “I would also like to have a Rosary,” Walter said. “Would you happen to have an extra one?” Mario was happily surprised at the request. He gave Walter the Rosary that Padre Pio blessed for him when he visited San Giovanni Rotondo in 1957. Walter told Mario that the grief he experienced over the loss of his son, made him aware for the first time in years of his need for God. Walter began attending Mass on Sunday and eventually became a daily communicant. After Walter’s conversion back to his faith, he saw his work as a psychiatrist in a whole new light. For his clients who were Catholics, Walter often recommended to them that they go to confession. He would say, “I am only a man. I want to help you but I am limited in what I can do for you. I am not able to relieve you of the guilt that you feel. But God can. Make a good confession as soon as possible and you will experience the healing power of the sacrament and a great sense of freedom.” Later in his life, when Walter was diagnosed with cancer, he united all of his suffering with Christ’s sufferings, and offered it in reparation for sins. When Walter passed away, he was at peace with God. He was buried with the Rosary that Padre Pio had blessed. Mario continues to lead the all night prayer vigils on the first Friday of each month at Our Lady of Peace parish in New York City. This year, 2009, will mark his 40th year as organizer of the vigils. He is very happy that his son has agreed to continue the prayer vigils and the annual celebration Masses for Padre Pio when Mario is unable to do so. Mario has recently been invited to Africa to speak to the people there about Padre Pio. He is enthusiastic and excited about future possibilities. “Perhaps God has some new work for me to do,” he says. “Preghiamo, figiu mi,” (Pray, my son), Padre Pio advised Mario each time he asked him for guidance. Mario has learned to entrust all of his plans to prayer. Mario, through the years, has learned the supreme importance and value of seeking the deep spiritual realities of life. Once, he found his soul to be in a precarious state. His brief encounter with Padre Pio in 1957, changed all of that and set him on a completely new path. Since that time, Mario has seen miracles both great and small. Most importantly, he has seen countless lives transformed and restored through the message and the intercession of Padre Pio. There is a quotation which says, “I am only one, but still I am one; I cannot do everything, but I can do something; I will not refuse to do the something I can do.” Mario Bruschi is only one person. Of course we know that he cannot do everything for the Kingdom of God. No one can. But he has never refused to do the work set before him, the work that he has felt especially called to do. And he has done a lot.